If you have recently deleted some important WhatsApp messages and are looking to recover them, you've probably noticed that the only recovery technique offered by WhatsApp is to restore from a WhatsApp backup made through the app to iCloud. You may not have a backup of the messages, or you likely don't want to restore the backup and delete all off the message history that's happened since the backup was made. 1) Download the free trial of Decipher WhatsApp on your computer. 2) Open Decipher WhatsApp and select your iPhone backup in the left-hand column of Decipher WhatsApp. 3) Select a contact and click the “recover” icon in the top of the middle column. You will then be presented with a list of deleted WhatsApp messages. Note: If you don’t see the deleted chat that you are looking for, simply make a new backup of your iPhone via iTunes and then try running the recover again. 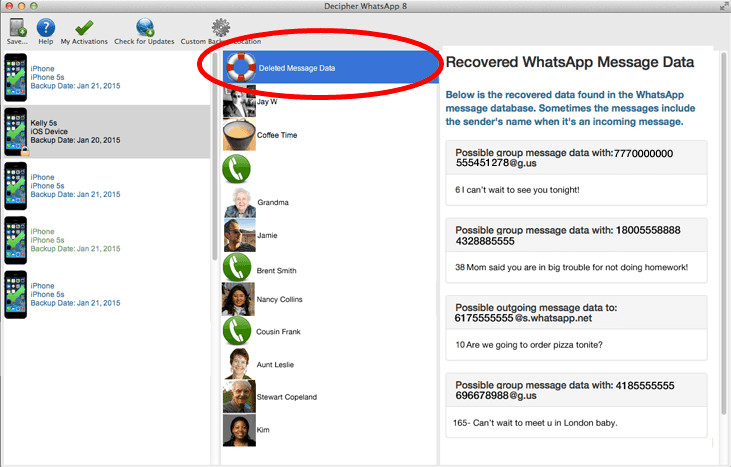 After following the three simple steps above, you should now see any recoverable deleted WhatsApp messages within the Decipher WhatsApp program window. If you are still having troubles recovering deleted WhatsApp chats, feel free to send us a support email and we'll be happy to try and assist further.